careful thought has gone into choosing the verbs that fill each segment of the orange. The list is by no means definitive but serves the purpose of clearly articulating what you would see someone doing if they were “understanding” or “applying” in their learning. You may have noticed that there are seven verbs in each segment. This number was decided upon purposefully as a result of research into how many discrete pieces of information the human brain can contend with at one time. Newer research would say that the number seven is too high – that it is more like 3 or 4 – but the Smart Tutor folks felt that seven was a good number and would ensure all could be recalled. I think it is a good idea to share these types of things with students. 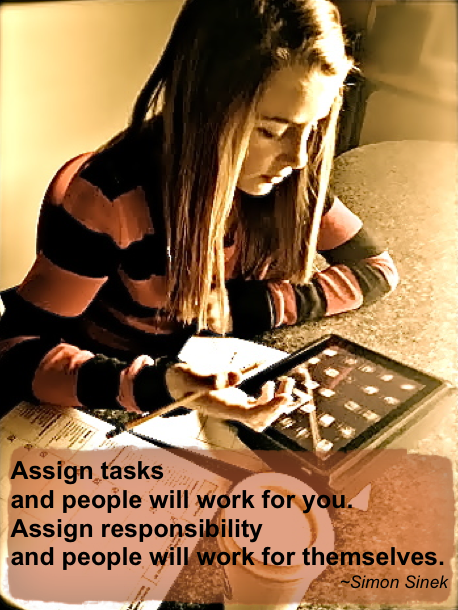 I also think they are good tools to use as a self-assessment of what you are asking of your kids as a teacher. What segments get the most of your attention? What do your kids spend the most of their time doing? Today I got some great advice from Simon Sinek in my mailbox that in the light of our Exhibition, I not only endorse and believe in, but I know to be true. “passionate, persistent citizens, who are fearless and strong”. Nothing there are being compliant, checking of boxes, waiting to be asked. Tagged Blooms Taxonomy, Imagine a School, Simon Sinek, What is School for? Next postFollow Your Passion – If Tony can, so can you! Very thought provoking Sonya…thanks for the post. I have so many thoughts about school, that it’s really hard to fit them into a comment, but I’ll do my best. Ultimately, school is to make good people who can critically think through issues, take responsibility, and work together. Granted, there’s more to it than that, but I think it’s a good place to start :). ps- I LOVE my bumper sticker! Thanks Phil! That is a great place to start, Phil. Thanks for sharing! I agree, the question is loaded and extensive in the possibilities for how it might be answered. We have to start somewhere though, right? I think the more the answers to that question sound like yours and the less we hear things like “to get into a good university”, we will be on the way to the change needed to Make School Different.